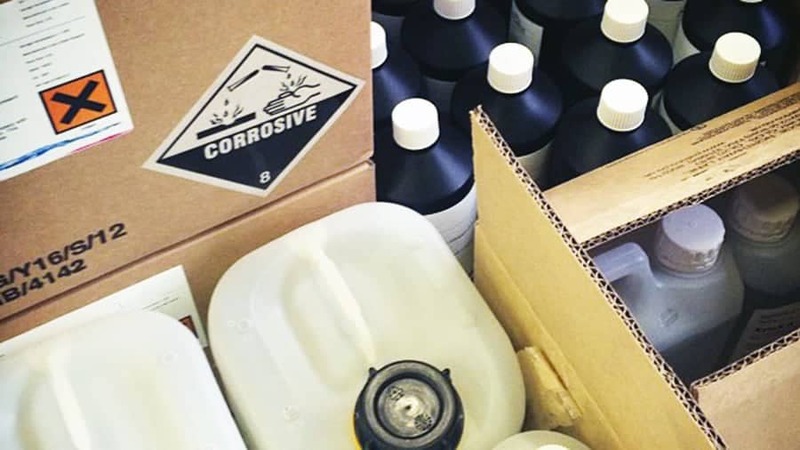 We offer a variety of packaging materials and have displayed the most common types of packaging here, as well as information about how we brand our packaging and some insight into environmental issues in the chemical packaging industry. These are our standard packaging options. If you require something different just get in touch and we’ll source it for you. 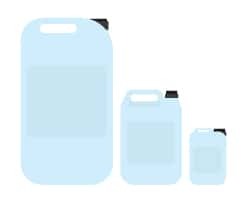 Our Intermediate Bulk Containers (IBC’s) are made of High Density Polyethylene (HDPE) and are ideal for the storage and transport of bulk substances. IBC’s are contained within a protective metal cage and the HDPE material makes the container more hard-wearing. They contain a tap to facilitate easy dispensing of your product, as well as top access to the substance. Drums are strong, durable and easy to stack and store. You can choose to store your product in 200L drums and this gives you the option of stainless steel, plastic, paper or composite material. 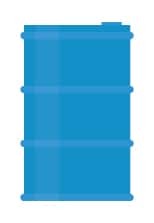 A composite drum has a double wall – useful for storing particularly hazardous materials. The outer skin is steel to ensure the drum is sturdy, whilst the inner is plastic to provide a safer option. Drum material is usually chosen based on the individual needs and properties of your product, taking into account safety, suitability and cost. We can supply drums with vented caps if necessary to ensure controlled release of gases. 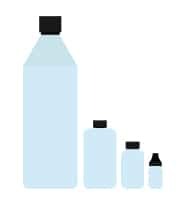 We offer bottles ranging in size from 5ml-1L, which are ideal for samples or test kits. Our bottles are made from HDPE or glass, which again depends on the requirements of your product. The 5ml bottles come with a dropper for more accurate dispensing of small volumes. The bottles are filled using volumetric bottle filling machines and usually come with a lid that can be screwed or unscrewed for easy product access. Jerricans (also spelt ‘jerrycan’ or ‘jerry can’) are also made from HDPE ensuring their suitability in a chemical environment and ability to hold hazardous substances. Jerricans are ideal for small batches or restocking and are fitted with a handle to help transportation. The 25L jerricans have an optional tap or vented cap, should your individual product require this for increased Health and Safety measures. We offer sachet filling, which is the perfect option when you need to hold small amounts of product in an easily disposable package. Our sealed sachet packets can be designed however you like, and can hold liquids, powders, creams and gels. We don’t set a minimum or maximum limit to your batch size, meaning we can cater to your needs whether you’re doing a short product trial or a full production run. We are able to take you from the initial prototype of your product to full-scale manufacture. If you require a very small sample of your product, you could opt for glass ampoules. Ampoules are ideal for single use liquid products that require protection from airborne contaminates, such as pharmaceutical products. The ampoules are hermetically sealed using a flame, which stops any contaminates or glass shards from entering the container. Ampoules can work with any non-flammable liquid that is compatible with glass, so we can advise if they’re suitable for your product. For our standard packaging, we use ReAgent branded labels. This packaging comes with the ReAgent logo and shows your customer that you use a well-respected supplier with a focus on Health and Safety. All of our packaging conforms to the many regulations in the chemical industry. They are correctly labelled to describe the type of product inside, display appropriate warning symbols and instructions on how to store and handle the product to help and protect end users. We follow the BS 56053 labelling standard, which states that labels on chemical packaging must be durable so that information will be legible for as long as possible. We can use your own company’s branded packaging and product information if you’d prefer. This gives you the opportunity to apply your company’s unique style to your products. Work with our in-house labelling experts if you’d like to create something new for your product. 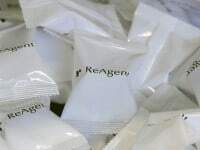 Take comfort in the fact that no matter which packaging option you choose, they will always conform to the rules of the chemical industry and we will take care of that. There can be some complications when using recycled packaging in the chemical industry. This is due to traces of chemical substances on packaging and the need to have clear knowledge of the contents in a container. It’s important to never mix chemicals without the correct chemistry knowledge and procedures. Taking safety into account, ReAgent’s recycle rate currently stands at 98% and we aim to keep this figure up and continue practising responsibility towards the environment. We’re able to recycle our glass bottles, cardboard and paper, and old plastic containers. We use recyclable material where we can. For example, HDPE is widely recycled and this is a possible material for most of our packaging options. If you’d like your packaging made from recycled packaging, let us know and we will work with you to accommodate this.